Daniel is a freelance journalist who writes for Swedish newspapers Svenska Dagbladet and Dagens Nyheter. Together with Linus Larsson he has written a long list of revealing articles with a focus on IT and hackers, which have had a major impact both in Sweden and abroad. The music industry is evolving rapidly, but the tools used by musicians are still largely stuck in the past. Enter Stockholm-based Auxy, backed by the founders of SoundCloud and Readmill (now Dropbox), and its radically simplified approach to music making. In late february 2007, eighteen-year-old Tim Bergling worked up the courage to post a few tracks on a Swedish-language web forum for musicians. The accompanying message was simple enough. “Hi all, I hope this is the right place for this. I’ve made a few tracks and I’d like to hear what other people think,” Bergling wrote, using the handle Timberman. Two weeks later, Timberman tried again. “Nobody? :(“ he wrote in response to his first post. Four years later, Tim Bergling, now using his the stage name Avicii, released his single ‘Levels’. It topped the charts in both Europe and the US, propelling the young Swede to superstar status and making him one of the most recognisable names in dance music worldwide. His story exemplifies the rapid changes sweeping through how popular music is produced. Electronic music has gone mainstream and many performers go from bedroom enthusiasts to superstar DJs within months. Social media and platforms such as SoundCloud and YouTube enable music to get shared and disseminated at a pace unheard of even a few short years ago. Even so, the tools used by musicians have remained largely unchanged. Costly, multi-layered software packages designed primarily for workstation use are still the norm. His favourite term for the competition? “Spreadsheet music making”. “It’s when creation feels too much like work and it’s hard to be creative because the tools you’re using make you so frustrated. We want to create a better experience and help tomorrow’s music makers realise their ideas,” he explains. Lenberg has spent years working at the intersection of music and technology. Back in 2009, he joined SoundCloud as one of the then-fledgling company’s first employees, eventually moving to San Francisco to establish its first office in the US. Before that, he worked at Propellerhead Software, a noted Swedish maker of music tools known for software synthesisers such as Reason and Rebirth. No surprise, then, that among Auxy’s first backers are Direkt Ventures, a newly-formed fund set up by, among others, SoundCloud founders Eric Wahlforss and Alexander Ljung and Readmill founder Henrik Berggren. Auxy has closed a seed round, led by Connect Ventures, for a total of about $1 million. 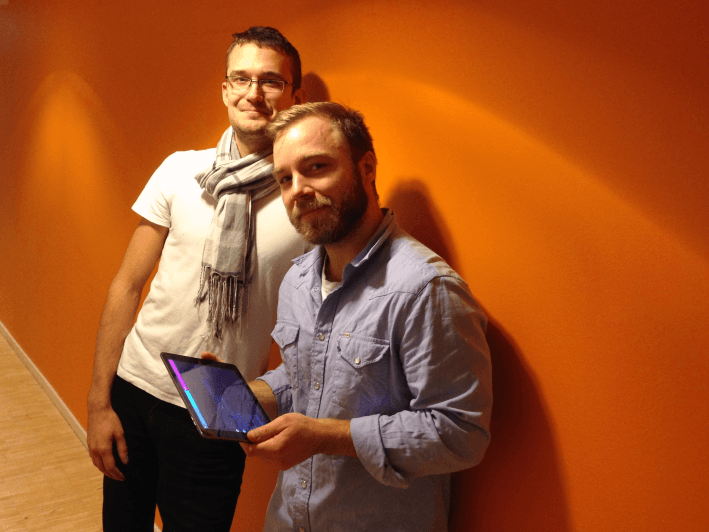 The company is now looking to grow the team in Stockholm with more developers. 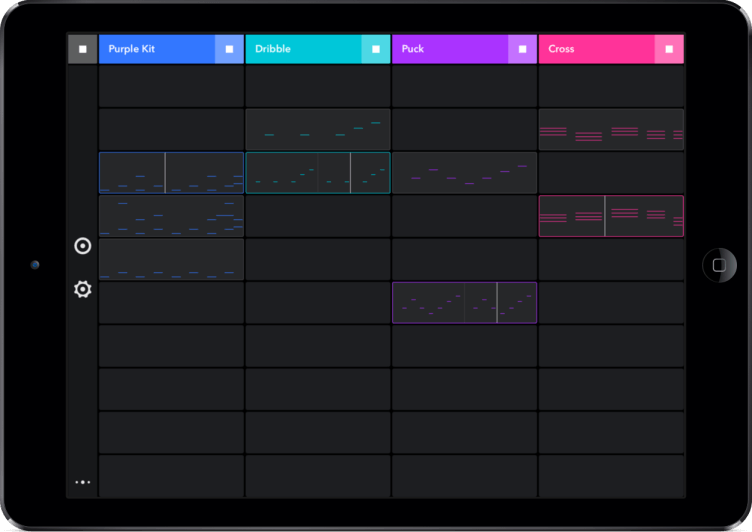 Auxy’s first product, a free music-making app for the iPad, launched to rave reviews in early October and raced to the top of the charts in the App Store ‘music’ category. The software is staunchly minimalist in design, with a simple, intuitive touchscreen interface and a clear focus on approachability, ease-of-use and plain fun. The business model revolves around in-app purchases. Auxy for iPad is free, but the plan is for a steady stream of additional features and new instruments to arrive down the line, which will be sold at an additional cost. In essence, the company is attempting to do for electronic music-making what apps like VSCOCam and, to a certain extent Instagram, have already done for photography. By marketing near-professional grade tools in a neat, approachable package designed for the mass market, the idea is to build a community large enough to sustain a price point far below what the competition is charging. Instagram enabled millions of new photographers. By applying the same recipe, Auxy wants to open up electronic music-making to a much larger group of people. To wit, Auxy isn’t the first company to try a pared-down approach to music-making. Propellerhead Software recently launched Figure, a $1 iPhone app that can be used to create drum tracks, bass and synthesiser loops on the go. Musyc, another popular (and free) iPad app, incorporates gravity and physics into an almost game-like music-making process. But Lenberg is adamant that Auxy is a very different animal. His company creates tools for serious music making, he says, only doing away with unnecessary clutter. Despite its simplicity, Auxy is meant to handle full-length tracks in a wide variety of sounds and styles. “It’s definitely not a toy. We take our users love for good music very seriously,” he posits. Marketing-wise, Lenberg is betting heavily on word-of-mouth. Thanks to positive mentions in a few big name media outlets, plenty of buzz on Product Hunt and a “featured app” spotlight in the App Store, social media was awash with mentions of Auxy only a few short days after launch. “Well, yeah. That would be pretty cool,” Lenberg says with a smile.